We offer for rent lucrative office premises on Moyzesova Street in Bratislava, nearby to the historical center of the city. Useful area of the premises is 117 sq. m. Premises are located on the ground floor and they have a separate entrance. 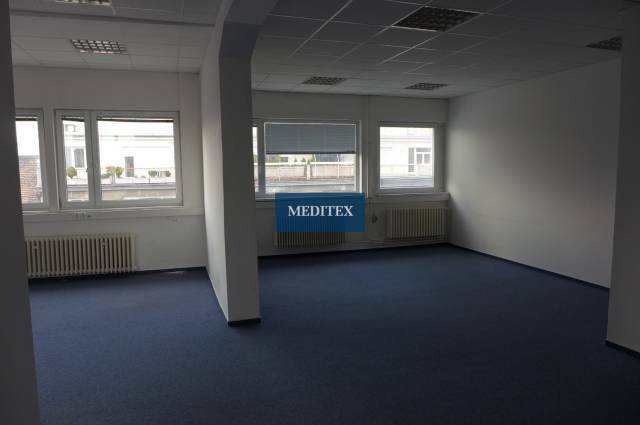 The premises consists of three connected units (55 sq.m., 33 sq. m., 19 sq. m.), kitchen, storage and toilet. The premises are equipped with structured cabling, high-speed internet (T-com, Orange, UPC) and security system (alarm + camera system). Accessibility of the premises are 24/7. Premises are rented furnished. They are available from 1st of April 2019. Please note, utilities will be added to the price. The historic building, where the premises are located, has completely renovated interior and the exterior. By walking distance from building is the Presidential Palace as well as many historic buildings, currently used by various companies. With its location right in the center of the city with full amenities (restaurants, cafes, offices, services, public transport), these premises are a suitable place for law firms, advertising and marketing agencies. Your listing no. ZR-1258a seems interesting, please contact me. Send me more information about the offer no ZR-1258a.